� Presseye.com- August 13th 2016, Danske Bank Premiership. 'Dungannon Swifts v Coleraine, Stangmore Park. 'Coleraine manager, Oran Kearney during Saturday's match at Dungannon. 'Photo by TONY HENDRON/Presseye.com. Oran Kearney pulled no punches after watching his side fall to a heavy defeat against Dungannon Swifts on Saturday. 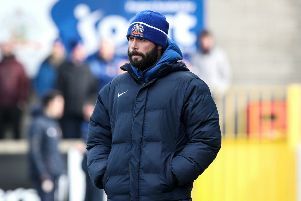 The Bannsiders boss was visibly stunned by the poor performance from his players as they shipped four goals without reply at Stangmore Park. � Presseye.com- August 13th 2016, Danske Bank Premiership. 'Dungannon Swifts v Coleraine, Stangmore Park. 'Swifts' Ally Teggart beats Coleraine keeper Christopher Johns to open the scoring during Saturday's match at Dungannon. 'Photo by TONY HENDRON/Presseye.com. Things started badly and got progressively worse as the Swifts ran out comfortable winners in the end. The hosts got off to a dream start as Ally Teggart bundled the ball home at the back post on three minutes after Jamie Glackin’s cross from the right caught the Coleraine defence napping. But the home side didn’t have long to wait for a second as Harpur popped up in the right pace at the right time to double the lead. Seanan Clucas drilled a low cross into the six yard box, and the captain slid in to make it 2-0 on 26 minutes. And just three minutes later it was 3-0 as Clucas diverted in Teggart’s corner to make it a magnificent half hour for the Swifts. Harpur was instrumental for the fourth after a mistake by Johns. He spilled Mitchell’s shot and as Harpur followed in the ball was bundled in by a combination of the midfielder and the keeper. “They haven’t had to earn any of their goals today,” Kearney told Times Sport. “I’ve had very few days like this in my time at the club, it’s right up there with one of the worst. “There’s absolutely no positives for us to take out of that today. “It’s the extremes of performance which concerns me. “The message before the game was we wanted the same intensity and attitude as we produced at Windsor Park on Wednesday night. “We also have to remember we only got a point for that too. “So we craved all that was good in midweek again today, all the basic stuff which should be there every week. “But that sadly was what was missing today, and I said to the players that I feel robbed. “How in the space of 72 hours can they give me one extreme to the other? Kearney was hoping to see his side charge out of the blocks and put the pressure on the hosts. “We didn’t start well, we conceded after two minutes. but I thought we controlled things for the next 20 minutes or so after that and had a few half chances,” he said. “But we got hit with two sucker punches after that which just changed the game completely. “It left it an uphill battle after that and it looked that way. “We have generally been good starters in our games and the big emphasis was really to start well. “I felt if we could go ahead it would put the pressure on them, especially with them losing their two previous games. “But they end up scoring within two minutes and it totally changes the game. “We were bereft of ideas, and to be honest in my time at the club I don’t remember much worse than that.